Leupold VX-II 3-9x50mm Riflescope FREE SHIPPING! The Leupold VX-II 3-9x50mm Riflescope provides hunters and shooters with reliable high performance. Its finely adjustable finger-operated windage and elevation controls and variable magnification with tactile power indicator make difficult shots easy, and it comes with a choice of Duplex, Heavy Duplex and LR Duplex reticles to suit your individual needs. Inside the rugged aircraft-grade aluminum tube, the exclusive Index Matched Lens System provides exceptional image clarity and sharpness. Each glass surface features an individually calibrated layered coating to maximize reflection-free light transmission, as well as a glare-reducing blackened edge. The fast-focus eyepiece provides a generous eyebox that allows a variety of comfortable shooting positions, and the tube is filled with a second-generation blend of argon and krypton to make it fully waterproof for safe all-weather use. 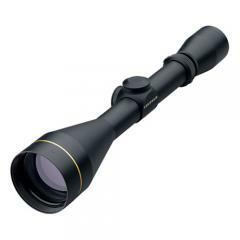 ©2002-2019 CopsPlus.com: Leupold VX-II 3-9x50mm Riflescope FREE SHIPPING!